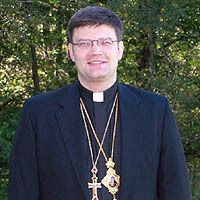 Bishop Paul Peter Jesep, Ukrainian Autocephalous Orthodox Church Diaspora, speaking in his individual capacity, praised 12 Orthodox priests, representing Greek, Russian, Georgian, Ukrainian and Ecumenical traditions, who challenged worldwide Orthodoxy to remove anti-Semitic texts from the Divine Liturgy. The priests did so with a 12-point statement at an April conference convened in Israel, according to the Jerusalem Post. "The Liturgy must be modified so that it is brought closer to the teachings of Christ," said Bishop Jesep. "These priests are honorable, courageous prophets. The Church has not done enough to address anti-Semitism. Sadly, Orthodoxy and in particular the Church in Eastern Europe is sometimes perceived as a place where hate and spiritual ugliness flourishes through religion. Our faith has not been honest about its role in directly and indirectly contributing to the abuse of fellow members of God's family." "Orthodoxy is supposed to mean 'right or correct belief,' but what does that mean? It is an empty phrase when anti-Semitism and social injustice is spoken or implied in the name of God. The Creator is truth! To be true to the Holy Author is to follow the two greatest Commandments taught by Jesus: 'love the Creator and love one another as He unconditionally loves us.' It is impossible to love God and our sisters and brothers when any member of our family is mistreated," Bishop Jesep said. "To love God and one another is to accept our neighbor, the stranger and the person of another faith as an equal member of our family. We are all God's children. The Divine Liturgy must reflect such a powerful message of Christian love."